For those who live in places where regular summer rain showers occur, it may seem silly to grab a camera and take photos of wet plants. …elicit hope of softer days ahead. Everyone is gratified and energized with rain. This entry was posted in Texas Thunderstorm, Uncategorized and tagged Texas Thunderstorm by Tina. Bookmark the permalink. Lovely photos Tina. We barely got a sprinkle but every drop was welcomed! 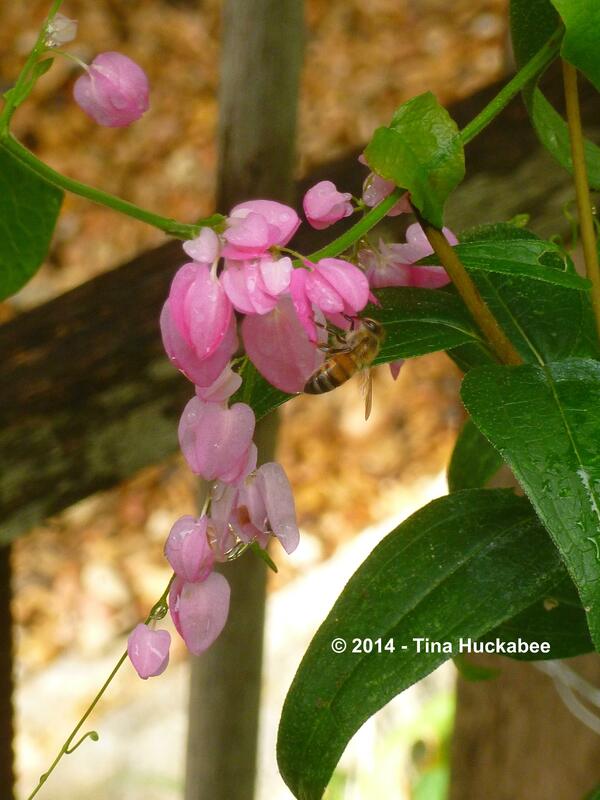 I over pruned my coral vine and it is just now getting back to putting on flowers. I’m keeping fingers crossed for a long mild run-up to winter so we’ll get our share of those pink blossoms here as well. I’m sorry you didn’t get much rain. I was in South Austin in the early afternoon and saw the gathering clouds, though I didn’t expect anything at my house. But it belted down briefly and it was lovely. Well, the humidity wasn’t so lovely, but all other results were! My Coral Vine has been really pokey this year–usually by now it’s covered in pinkness, but not this year, just a few strands. I have hopes for a better show in the coming months. Fingers crossed. Yes, the excitement was so great I nearly ran out to dance in the rain. I was out taking photos this morning. No more raindrops but happier looking plants greeted me. Dancing in rain is always a good thing! Isn’t it amazing how a teeny bit of rain can perk up the gardens? Looking forward to more of the same. This morning I planted and moved a few things around and then we had a brief but intense shower. I love it when that happens. It was intensely humid out there though. It’s such a gift when nature cooperates with our gardening plans. The humidity is tough this time of year after a rainshower. Ugh! No, I understand what you mean. We’ve had enough rain this summer, but we had a horrible drought in 2012 here in the Midwest, with no rain from the end of May until late July. And temps were in the 90s and 100s for most of that stretch. The heat would have been OK, but we didn’t have any rain. And in this part of the country, most of our plants aren’t used to that type of extreme drought, so many of them struggled. 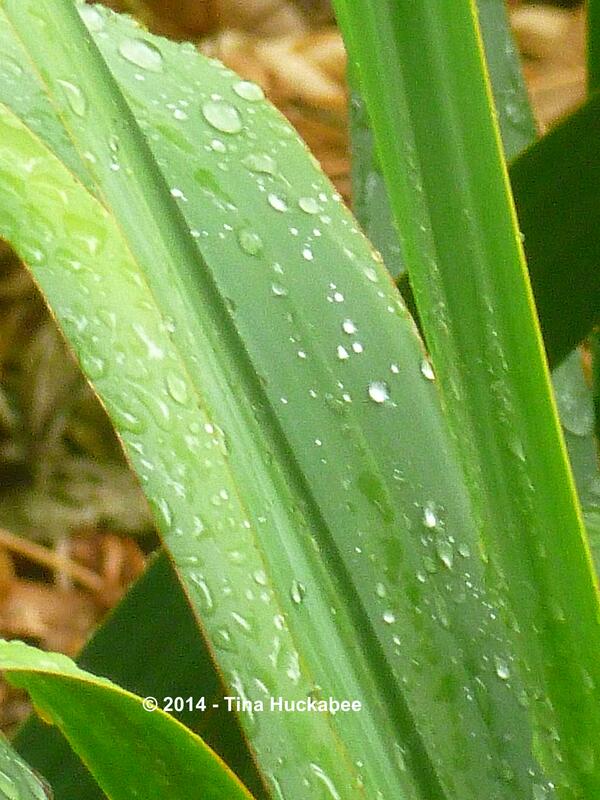 Anyway, yes, rain after a dry spell is a cause for joy! Cheers! It’s really tough when you’re in a drought situation and your plants/gardens aren’t able to cope. Here in Texas, we’re now continually in (at least) a moderate drought–too many demands on water resources and not enough rain to fill our aquifers/lakes/reservoirs. We had a really tough drought in 2011–extremely hot and dry. I hope I don’t ever see that again–I can live with a few days of 100+ degree temperatures if autumn comes with some regular cool and rain. 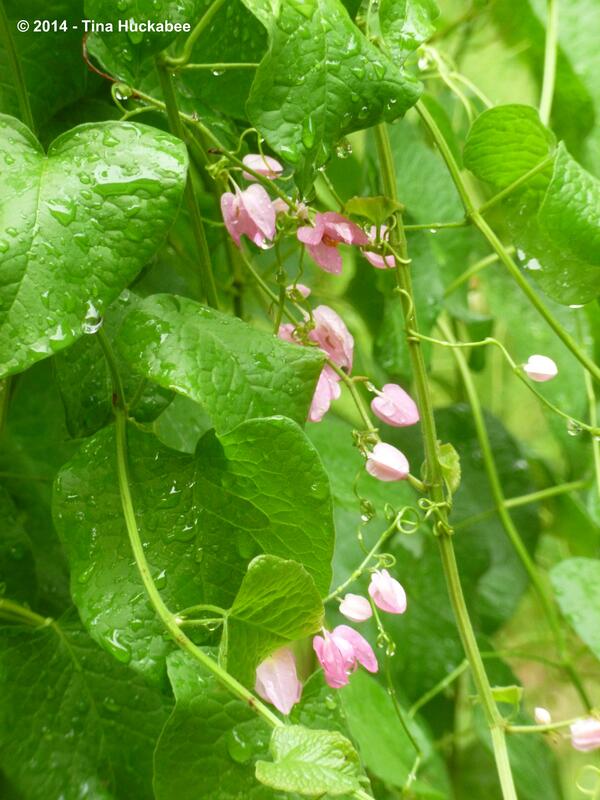 I love your coral vine. We have seen rather too much rain lately. I have spent a week in Italy ducking and diving to avoid the rain. We were rather hoping to bake ourselves. But of course as gardeners we can’ t do without it. I love my coral vine too! I hope it blooms up soon like it normally does in the autumn. Gosh, I wish I could spend a week in Italy dodging the rain. 🙂 Enjoying the warm weather is essential when you live in a colder climate; enjoying rain for the gardens is something we all can appreciate.